The lake is an important and iconic part of Canberra and its character. It’s one of the key features that makes Canberra such a beautiful city and wonderful place to live and visit. Walter Burley Griffin and Marion Mahony Griffin’s original plan intended the city’s public street and space network would continue down to the lake in West Basin, ultimately connecting the city centre and Lake Burley Griffin. The ACT Government is progressing the development of West Basin, in line with the National Capital Plan, to bring the everyday life of the city to the lake. There is currently about three hectares of surface carparks at West Basin. Once complete, the waterfront will have approximately four hectares of new public space, including parkland for all Canberrans to enjoy. Just as with Sydney’s Darling Harbour, Brisbane’s South Bank and Melbourne’s Docklands, a redeveloped West Basin will unite the city centre with its best landscape feature. An easier, more direct connection to the city centre will create a more accessible and people-focused destination that will encourage even more locals and visitors to enjoy our lake than ever before. Stage 1 of construction was the creation of Henry Rolland Park and the first 150 metres of boardwalk. It started in November 2016 and is now open to the public. The area had been underused for many years and was primarily a car park. It is now a high-quality public space that will be a premium recreation destination for years to come. 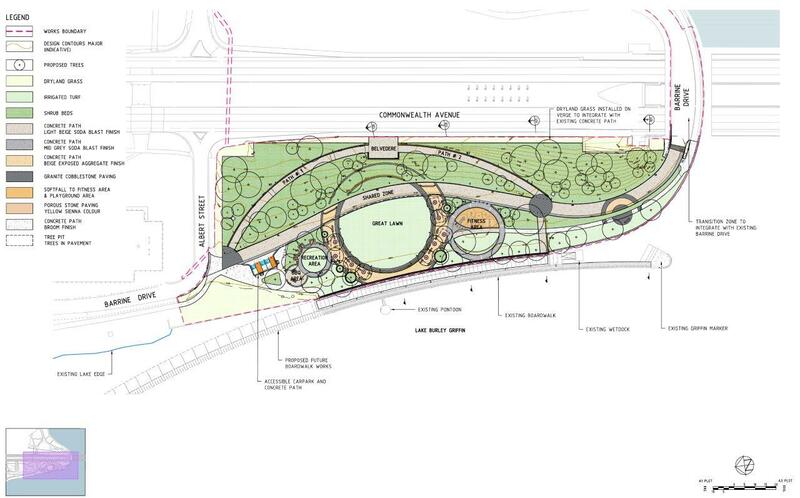 It is the ACT Government’s intention to complete the lakeside public spaces prior to starting work on any of mixed-use development precincts that will bring the city centre across Parkes Way. Stage 3 will see the creation of a generous waterfront urban park adjacent to the boardwalk that will separate the lake edge from any new buildings. The ACT Government has stated that new building development will begin close to the city centre before extending to West Basin. The former Land Development Agency had undertaken high level planning for the precinct, including producing a preliminary master plan. The City Renewal Authority’s focus is centered on design-led, people focused renewal, community benefit and economic revitalization. The City Renewal Authority is currently reviewing the planning previously undertaken before taking further decisions around the scope, timing, and delivery method of any future West Basin development. All development in West Basin is subject to approval by the National Capital Authority. In 2013, community feedback was sought during two consultation periods. Feedback received specifically in relation to West Basin waterfront, highlighted the importance the community placed on public access to the lake. 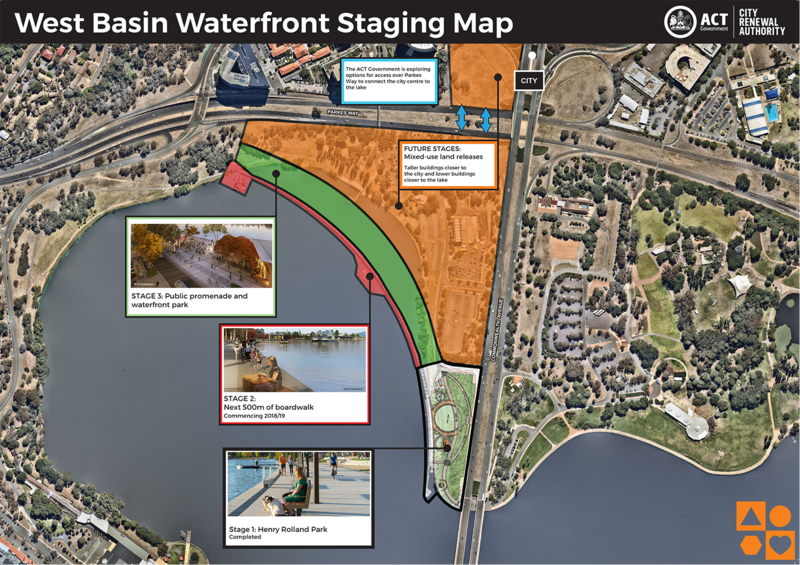 While embracing the vision for the proposal, existing lake users indicated they wanted to continue to use walking and cycling tracks at West Basin, and enter the lake for water sports without impediment. As a result of this feedback, continuous public access to the lake edge will not only be maintained in the precinct, but enhanced to improve user experiences. Community feedback also showed that creation of public areas, before any building development occurred, was preferred for this area. The ACT Government listened to this feedback and is continuing to progress the development of public areas in West Basin as a high priority. In June 2015, the community was once again invited to provide feedback on the proposed waterfront design, and have their say on the types of commercial activities, community facilities and events they would like to see down at West Basin in the future. We will continue to consult with you as future stages of development progress to make sure West Basin is a place for everyone to use and enjoy.